At last year's CES, Haier showed off a transparent TV, which never took off for the obvious reason that nobody needs or wants a transparent TV. 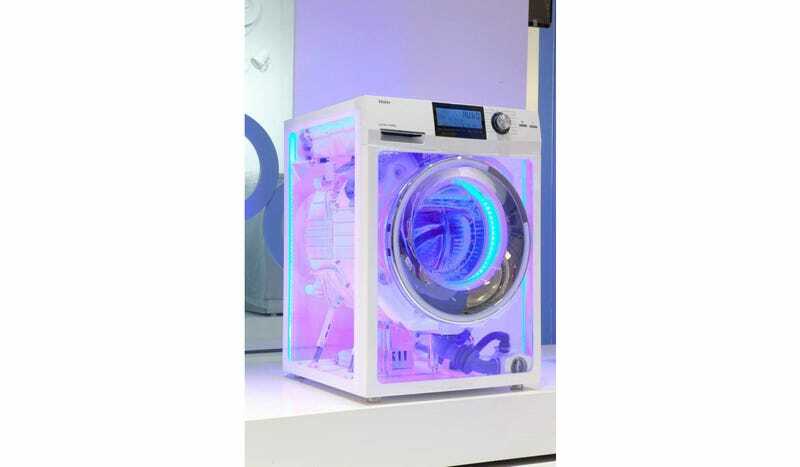 Today, a great leap forward: a neon, see-through washing machine. This is. The. Future. Haier admits the see-through washer is a "concept piece," which is more or less an admission of non-existence outside of CES—all we're told is "The transparent washer is currently not slated for availability in 2013." Maybe 2014. Maybe 2024. Maybe that's a good thing—I doubt domestic America is ready to wash its clothes in an appliance that looks like a spacecraft warp core, and it's hard to imagine the lighting makes the thing very green. But it's nice to see something at the show that shows some joy, even if it's a dumb, LSD joy. I'll take this hoax of a washer over another Windows 8 tablet.